We wear all black, formal attire to gigs. Do you need anything provided at the venue? All we require at gigs are chairs (without arms), a decent amount of space to set up, decent lighting (so we can read our music), and if playing outdoors we require a fully covered area (i.e. a covered patio, or a small tent). For the sake of our instruments, we cannot be exposed to precipitation or direct sunlight. Direct sun can do permanent damage to the instruments’ varnish, and puts our strings out of tune… of course we don’t want to be rained on, either! To book us, all we would need to know is: the date and location of your event, the start time of your ceremony/event, and whether you would like to hire us as a quartet (or trio, or duo, etc). We would then prepare and send over a copy of our booking agreement for you to complete and sign, and return to us, along with a non-refundable deposit. The balance would then be due on the date of the event. The actual deposit amount depends on a couple of things: whether you are hiring us as a quartet, trio, or duo; if we are playing only for a wedding ceremony, a ceremony plus reception, (or another type of event); and also if there is any significant travel involved. Please note that deposit is non-refundable in the event of cancellation. Do we get to choose the music for our wedding ceremony? Yes, of course- that’s the fun part! For wedding ceremony music: after we have received your deposit, and confirmed your booking, we would be asking you to choose which pieces you would like us to play for: the wedding party entrance, bride’s entrance, signing of the register, and wedding party exit. (Also, any other spots during the ceremony, such as candle lighting or communion). We will choose the prelude music from our repertoire- since the time needed beforehand can vary a great deal (i.e. if the ceremony starts late), we like to be flexible for that. Our complete repertoire is listed on our website, as well as some samples of us playing. *** A note to consider for smaller wedding parties and/or smaller venues: if you have a small wedding party and/or a shorter distance to walk in, for best results, we do recommend choosing just one piece of music, to be used for both the wedding party entrance and the bride’s entrance. This helps keep the pacing/flow of the music– please keep in mind that it does take us a few seconds to stop and turn pages, if we are playing separate pieces of music for the wedding party entrance, and the bride’s entrance. Do you play for events other than weddings? Absolutely! We’ve done many corporate receptions, Christmas parties, anniversaries, birthdays, graduations, celebrations of life/memorials, gallery openings… We would be happy to give you a quote for your special event. We are happy to take a special request for a song/piece that is not already in our repertoire, provided that we are able to locate the sheet music, or are able to make an arrangement of the music in a reasonable amount of time prior to the event. (We are totally open to your ideas, and have played everything from AC/DC to Enya)… Please give us at least a few weeks’ notice if requesting a special song for your event. Please note also that a special request will usually incur extra costs for which the client will be responsible- i.e. our cost of purchasing sheet music especially for an event, and/or for the time and labour involved in creating an arrangement (if time permits). We will do our best to accommodate a special request, as long as we are able to locate or arrange something playable by our ensemble. If you are looking for the ultimate special gift, our cellist, Elizabeth Knudson (who is also an Associate Composer of the Canadian Music Centre) is available to compose or arrange works especially for an event. If you are interested in commissioning a new piece of music, or a special arrangement, please contact us for more information. Please be advised that special commissions would generally require significant advance notice. Can you accompany my friend/relative singing? Yes, within reason, we’re happy to accommodate. If it’s one song, and we are able to locate sheet music playable by our ensemble, we have certainly done this before. Usually this would involve a quick run-through of the music at/near the venue, a few minutes before we begin playing the prelude music. If it requires significant rehearsal time beyond a quick run-through at the venue on the date of the event, please note that this would likely involve extra cost for our time/availability. Do you ever play for events outside the Lower Mainland (B.C.)? We are centrally located in the Vancouver area; however, we have played many gigs outside of the Lower Mainland (including Whistler, Tofino, the Sunshine Coast, Chilliwack)… Gigs outside a reasonable radius of Vancouver may be arranged with inquiry, and will include a fair travel fee. We do not attend wedding rehearsals. We’ve played at dozens of weddings, both religious and civil ceremonies, and are quite familiar with most ceremony formats. We always ask for a copy of the programme/order of service (if available), as well as a contact person (wedding planner, commissioner/officiant, member of the wedding party, etc. ), just in case we have any questions at all regarding our set-up and cues for the date of the event. We will also arrive at your event early to ensure we are set up and organized, and are fully coordinated with the wedding officiant regarding cues and any other relevant details for the ceremony. Our rates are non-negotiable. We do our very best to provide excellent quality service at very reasonable rates. Our rates are based on our many years (lifetime) of musical training and education– we all have university degrees in music– plus years of professional experience. Our rates also reflect the preparation work/time, and other expenses involved for us: upkeep of instruments, purchase and preparation of music, travel and parking expenses, time spent consulting with clients, etc. We appreciate having our work and time treated with respect. Can I watch your quartet perform somewhere? 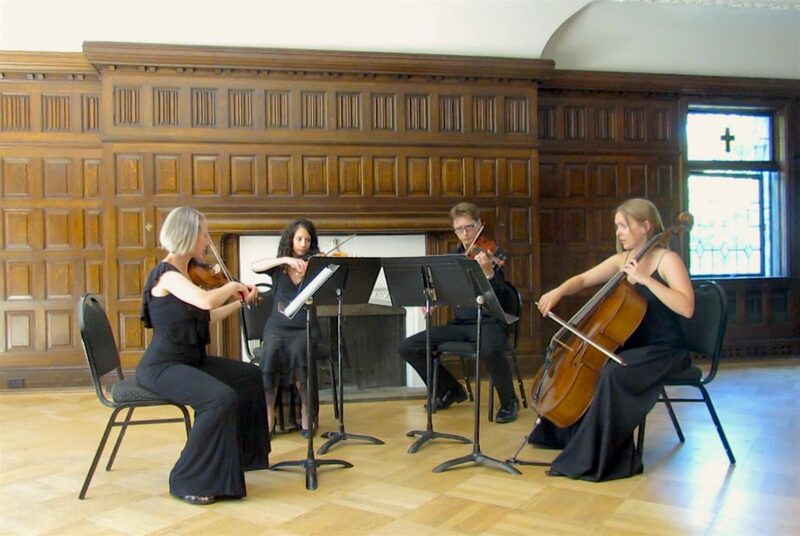 Our quartet currently performs for private events only, but as individuals, we perform regularly with many of the regional orchestras around BC. We also have some video clips on our website (http://www.syrinxquartet.com/repertoire), as well as a YouTube channel, so you can watch us play! If you have any questions at all, or would like some advice on selecting music for your special event, please don’t hesitate to get in touch!